Andy Yanowitz is a software engineer at a computer company in Cupertino, CA, who is happy to finally have his well-deserved vacation. When Andy isn’t working, or taking care of his three smart and talented kids, Andy spends his time playing in his music studio, shooting and editing video, experimenting with real-time multimedia, and banging on his drums. 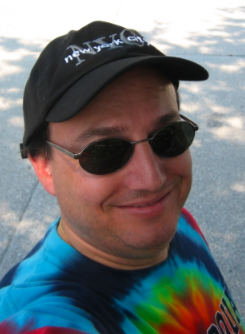 Andy has a degree in Computer Music and Audio Engineering from the University of California, Santa Cruz (graduated in 1988). He now lives in Ben Lomond, CA, with Andrea, his wife of more than twenty years, his high-energy Australian Shepherd named Samantha, and his even more high-energy boys, Jeremy (12), Jordan (9), and Benjamin (9). This is Andy’s first trip to Morocco. Dror Sinai is an international performer, educator, and guest artist, as well as the Founder of RHYTHM FUSION, Inc. in Santa Cruz, CA. 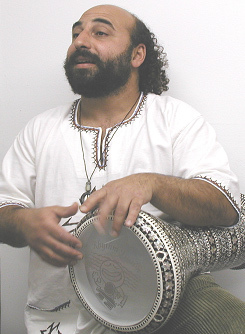 In 2002, he received the Gail Rich award for supporting the arts, and is a founding member of the World Music Committee for the Percussive Arts Society.